The Declaration of Health Data Rights collaborative effort was announced this week by setting forth a simple, straightforward framework for health consumers right to their personal health information. The social media driven initiative has grown support throughout the week. The effort is being endorsed and supported by a variety of companies/organizations and bloggers. The traditional media has also covered the initiative, including the NYT, "A Push for the Wired Patient's Bill of Rights," Boston Globe, "Health data rights declaration gets push,"and the Huffington Post, "Release 0.9 HealthDataRights Beta Version." This evening I formally endorsed the declaration and statement of rights (Endorser #793). Read more about the initiave and consider supporting the effort at HealthDataRights.org. You can also follow the discussion on the declaration via twitter at the tag #myhealthdata. The rights set forth in the declaration are largely supported by existing state and federal law, including changes to be implemented under the new HITECH provisions of the American Recovery and Reinvestment Act of 2009. The declaration serves as a simplified and concise statement of rights that helps to alert and engage patients of the role they need to play as better health consumers. Engaged health consumers play a key role in creating the needed change and improvement in our health care delivery system. On June 8, 2009, the West Virginia Health Care Authority filed a proposed legislative rule with the Secretary of State and Legislative Rule-Making Review Committee titled Hospital Ambulatory Health Care Facilities. CSR 65-27. The official notice can be found in the June 12, 2009 issue of the West Virginia Register. The proposed rule impacts the procedure used by West Virginia hospitals to obtain approval prior to developing an ambulatory health care facility. The proposed legislative rule establishes the circumstances and procedures by which a certificate of need may not be required for the construction, development, acquisition or other establishment by a hospital of an ambulatory health care facility. The proposed rule sets out exemption criteria and the exemption procedure. The Authority established a comment period for interested parties to submit comments concerning the proposed rule. Written comments must be submitted to the Authority before July 8, 2009 at 5:00 p.m.
On June 10, 2009, the West Virginia Lawyer Disciplinary Board issued Legal Ethics Opinion 2009-01 (What is Metadata and Why Should Lawyers Be Cautious?) to raise awareness among lawyers to be cautious when dealing with metadata. The opinion describes "metadata" as the data behind the data - including the location where the document is created, opened or saved, author's identity, number of revisions, comments and redlining. The opinion concludes that lawyers have a duty on both ends. The lawyer sending electronic information has the burden of understanding what information may be contained in the electronic document and take reasonable steps to protect metadata in transmitted documents. Likewise, the receiving lawyer has the duty and burden when receiving inadvertently provided metadata to consult with the sender and abide by the senders instructions before reviewing such metadata. The opinion also points out that different rules on removing metadata apply in the context of responding to discovery responses and subpoenas. In this case the electronic documents may be tangible evidence and the rules of professional conduct may prohibit the removal of metadata, subject to an assertion that the metadata is privileged. More thoughts on the metadata opinion by Brian Peterson at West Virginia Legal Weblog. The West Virginia Lawyer Disciplinary Board also issued Legal Ethics Opinion 2009-02 (Wholly-Owned Subsidiary Law Firms) on June 10, 2009. This opinion looks at the question of whether one law firm can organize a wholly-owned subsidiary law firm. The Board concluded that law firms are allowed to form wholly-owned subsidiary entities but cautioned that law firms should keep these entities transparent and fully disclose to the public and clients the relationship among the seperate entities. were passed by the Lawyer Disciplinary Board at its June 5, 2009 meeting and entered on June 10, 2009. Click here 2009-01 and 2009-02 for the full Opinions. Microsoft HealthVault: You put your right HIPAA in . . . In a post today, Sean Nolan, Chief Architect of Microsoft Health Solutions and blogger at Family Health Guy explains Microsoft's position regarding whether Microsoft HealthVault is required to comply with the privacy standards under the Health Insurance Portability and Accountability Act of 1996 (HIPAA). The blog post, "You put your right HIPAA in . . ." provides some background on the process that Microsoft has gone through to look at the question of whether they are directly required to comply with HIPAA as a "covered entity" or whether the must enter into "business associate agreement"with other covered entities. Although they don't reach a final definitive conclusion Microsoft does state that they are now prepared to sign a business associate agreement with any covered entity who concludes that it is important as a part of their compliance and responsibility under HIPAA. The post by also includes a link to the standard Microsoft HealthVault Business Associate Agreement. The conclusion reached by Microsoft seems like a practical one to this health care lawyer. Anyone who deals with health information has a responsibility to assess whether or not they are a covered entity under HIPAA. They further have a responsibility to be a part of the conversation with those other person that they deal with who are covered entities as to whether a business associate agreement must be in place. However, the final decision of whether a business associate agreement is required must be made by the covered entity who is responsible for complying with the privacy provisions. Does the person/party provide certain "professional services to or for the covered entity" involving the disclosure of individually identifiable health information (as these terms are futher defined under the regulations). As stated in the post there is still unclear areas as a result of the ARRA HITECH privacy provisions that will still need to be sorted out as we move forward. However, the important issue is to continue to move forward. There is a growing discussion on the health consumer-centric (patient-centric) meaning of "meaningful use" of EHRs and health information technology. Jane Sarasohn-Kahn summarizes this discussion in her recent post, "Meaningful USe - or, whose health is it, anyway?" at Health Populi where she reflects on Ted Eytan's post, "Is it Meaningful If Patients Can't Use It?" Since Ted's post other health care thought leaders have offered their comments. A list of these individuals can be found in Jane's post. As Jane mentions, this topic was central to much of the discussion that occurred during the first two days of the testimony before the National Committee on Vital and Health Statistics (NCVHS) on the Future of Personal Health Records held on May 20 and 21. The discussion will continue at the NCVHS hearing on June 9 when there will be a panel focused on "Consumer Advocates and Attitudes" that will include Susannah Fox, Dave deBronkart, Deven McGraw, JD and Robert Gellman, JD. Jane mentions in her post our testimony before the Subcommittee on Privacy, Confidentiality and Security of the National Committee on Vital and Health Statistics (NCVHS) on the future of PHRs. Our panel, including me, Jane and Daniel Weitzner, the W3C Technology and Society Policy Director, opened the hearings on PHRs. Our role as the opening panel was to try to set the stage for the context of the discussion on the future of PHRs and consumer facing health care information technology. As the opening speaker at the hearing I decided to stay away from immediately diving into the legal issues and instead give the committee a landscape view of where I think we are in the history of health information. My goal was to provide a historic framework for PHR development by drawing some historic parallels to the history of the development of our transportation system. By analogy I compared today's PHRs to the Model T era of the automobile area and taking a page from Dave deBronkart told the committee my personal family e-health information story. Below is a complete copy of my written testimony submitted to the committee. As the discussion continues on "meaningful use" the role that PHRs play is important. Focusing on health care consumers and their practical use of PHR tools is vital to the future of our health care system. As I said in my testimony there will be game changers but we need to see the potential of today's Model T PHRs and build toward the Prius Hybrid PHRs of the future. Good morning. I want to thank the Co-Chairs, Subcommittee and Committee Staff for the opportunity to participate in today’s discussion on the current state of the personal health record (PHR) and the future use of this and other health care technology tools by the health care industry and the health care consumer. My name is Bob Coffield. I am a health care attorney from Charleston, West Virginia, with the law firm of Flaherty, Sensabaugh & Bonasso, PLLC. I have a broad-based health care practice, providing legal and business services to a variety of health care clients. A large portion of my practice focuses around health information issues, regulatory compliance, privacy, security, and health technology. Over the past five years, I have become involved in the social media movement, and that involvement has changed the way I live, work, collaborate and communicate. My involvement and interest in the social media movement and its impact on our lives has led me to focus a portion of my practice on legal concepts and issues generated by the use of social media tools and technologies in health care, law and other industries. As the opening speaker, I want to set the stage for today’s discussion on the questions raised by the committee. As the committee examines the issues, I recommend that you look toward a longer horizon of 20 to 50 years. In this age of information and accelerating technology, it is often easier to predict what may happen in 50 years than what will happen next year. As information technology advances and new technologies are developed, it has become more difficult to conduct short-term strategic planning in the three to five-year range. Over the past 10 years of the maturing information era, we have seen incredible advances and significant disruption in all business, including health care. At its center, the information age is characterized by the ability to create and transfer information and knowledge freely and to have instant access to knowledge that would have been impossible, difficult or too expensive to find in the past. Jane Sarasohn-Kahn and others today will provide the Committee with an understanding of the current health care consumer marketplace and the major motivators driving health care consumer empowerment in the information age, and also will provide a perspective on the current state of consumer engagement in health care. It is my belief that this changing era is having a profound impact on today’s health care industry. The strategies, systems, approaches and governing rules used today and by past generations may not be successful in today’s and tomorrow’s changing information era. A part of today’s process should be to consider what the long-term goals are for health information technology, including the PHR, and how it can be used to drive consumer-focused and controlled health care in the information age. Along with this discussion, we have a responsibility to talk about why involvement of the consumer matters and what impact it will have on improving care, reducing costs and creating efficiencies in the health care system. As we discuss health information technology and PHRs today, we have a responsibility to stay focused on this question: “What will improve the quality of care for you and me, as consumers of health care?” This single question needs to remain at the center of today’s discussion and the continuing debate on consumer health information technology. As the health care industry becomes more and more specialized, complex and technologically advanced, we often lose sight of the purpose of the health care system. That purpose is human care and compassion. You and I, as health care consumers, must remain at the center. My hope is that the future of our health care system will use technology, including PHRs, to improve the human experience and interaction between the professional caregiver and health care consumer. The questions I often struggle with and hope to hear discussion on today are: How will PHRs drive consumer empowerment, and how will this consumer empowerment lead to improving care? We can all sit around and discuss the best ways to build PHRs, but the questions remain whether or not the health care consumer will be attracted to use PHRs and whether providers will be willing to incorporate PHRs into the treatment and care process. As I said at the opening of my remarks, I want to set the stage for the discussion and testimony today by sharing a story and painting a historical perspective. As I looked over the agenda of those speaking today, I was struck by the level of experience and diverse backgrounds that each of us brings to the discussion. However, because of the level of specialization represented in this gathering, there is the risk of remaining deep in the weeds, dealing with details, and failing to step back and take a wider view of the landscape. The story and analogy I want to share with you is my attempt to take you on a tour of that broader view. I am a believer in the adage that history repeats itself. What we are trying to do today is to provide you with a perspective and prediction of the role that the PHR will (should) play in the health information technology infrastructure over the next 10 years. So a historical sketch of where we have been and where we are is valuable to the discussion of where we may go. I want to start the story with a quote from the 1800s, by inventor Oliver Evans, as he spoke about the future of the transportation system in the United States. "The time will come when people will travel in stages moved by steam engines from one city to another, almost as fast as birds can fly, 15 or 20 miles an hour . . .
A carriage will start from Washington in the morning, the passengers will breakfast at Baltimore, dine at Philadelphia and supper in New York the same day . . . . The 1800’s saw the dawn of the railroad system in the United States, as a result of the development of the steam engine. These developments led to the widespread use of trains as a mode of transportation for a growing population that, until that time, had been relatively immobile. The growth of the railroad system started at the local level, grew to regional connections and ultimately led to a national network of railroad tracks from east to west and from north to south. Prior to this time, personal travel required one to travel on foot, by horse or by carriage. My ancestors, who grew up in the hills of northern West Virginia, came to West Virginia (then Virginia) in the late 1700’s. As we say in West Virginia, “they lived out on the ridge.” A number of generations went by, and there was little mobility of my family. They lived out their lives on those same ridges for well over 150 years. They raised their families and farmed. They lived a relatively isolated and stationary life. Traveling beyond a few miles was difficult, impractical and largely unnecessary, at least from their perspective of the world. However, by 1900, the landscape had changed, and the Industrial Revolution was having a profound impact on the world. My great-grandfather and grandmother had two sons who were teens in the 1890s. In the 1890s, my great-uncle went to college, came back and taught school for a few years and then went on to law school. Likewise, my grandfather went to college, came home like his brother to teach school for a few years, and then continued on to medical school in Cincinnati, Ohio – at that time a long distance from the northern part of West Virginia. He came back and practiced medicine in Wetzel County, West Virginia, from 1911 until his death in 1936. 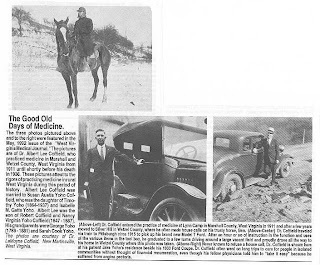 He saw home patients initially by horseback, and then in 1915, he traveled to Pittsburgh, Pennsylvania by train to pick up a brand new Ford Model T, which replaced his horse in his rural medical practice. As the rail system in the United States matured, it grew into a more complex mass transportation system. Individuals who, prior to that time, had used their own modes of transportation, whether on foot, by horse or carriage, started to rely upon the system for transportation. They became passengers who didn’t own the train or the rails. As the railroad system developed, we saw issues related to standards, such as the gauge of tracks. Local, state and federal government become involved in furthering the growth and expansion of the railroad system by providing financial support, political influence and regulatory assistance to the growing railroad industry. At that stage in history, no one in the powerful railroad industry would have predicted the disruptive influence by a young, different type of engineer - Henry Ford. With the advent of the automobile and the mass production of the Model T in 1908, our transportation system in the United States was forever changed. Over the next 20 years, the adoption of automobile travel was unprecedented. This revolution led to a demand for better roadways and improvement of the largely privately built turnpike roads. The Federal Highway Act of 1921 authorized the Bureau of Public Roads to provide public funding to help state highway agencies construct paved systems of highways, and this led to the Federal-Aid Highway Act of 1956, which authorized the creation of the Interstate Highway System. By analogy, we can compare the development of the transportation system to the development of today’s health information system and draw many comparisons and parallels. The health information system, up through the 1950’s and 1960’s, was paper-based, centrally located and uncomplicated. The medical record system for my grandfather’s practice – to the extent that it was used – was simple. Likewise, the medical record system and documentation used by my father and uncle during their medical careers, roughly 1940-2000, was relatively non-complex. During this time, there was little specialization: Physicians were generalists in everything. In large part, physicians from this era cared for their patients from birth to death and, in the case of my grandfather, father, and uncle, cared for multiple generations of families. Providers during that time had a relatively comprehensive picture of the medical history of each individual, as well as that individual’s immediate and collateral family members. Prior to specialization in health care, we had a health system focused on the individual patient, and health information was centered on that individual and the individual’s family. By the 1970’s, we saw the development of the first electronic health record – the problem-oriented medical record (POMR), predecessor of today’s current Electronic Health Records (EHR) and Electronic Medical Records (EMR). At this same time, we saw the expansion of medical litigation, which has played a significant role in the health information system over the past 30 years. Prior to 2000, little had been written or heard about PHRs. Back in 2001, in a report called Strategy for Building a National Health Information Infrastructure, the National Committee on Vital and Health Statistics mentions PHRs and the growing consumer use of Internet-based health information services. This was important because it was the first time that a national health body acknowledged or officially recognized PHRs. In 2005, the American Health Information Management Association (AHIMA) formed a work group to examine the role of PHRs in relation to EHRs, and the pace and interest in PHRs has continued to increase since that time. Over the last year, interest and activity in the development and use of PHRs has accelerated. This new-found interest has now culminated in the first law directly regulating PHRs and PHR vendors, under the Health Information Technology for Economic and Clinical Health Act (HITECH), which is a part of the American Recovery and Reinvestment Act of 2009, signed into law on February 17, 2009. How is the history of our transportation system analogous to our health information system? On a basic level, both provide transportation – one transported humans, and the other, human information. Both started as uncomplicated systems that were not interconnected. I imagine you are already formulating other parallel points between these two systems. To begin today’s discussion on PHRs, we need to examine where PHRs fit in this historical perspective and timeline. What is the equivalent of the PHR in the history of our transportation system? Today’s PHR is the equivalent of the Ford Model T. The PHR will be the vehicle to individually transport health information in the future, introduce the involvement of consumers in their own health information and wellness and inspire a time of innovation and creativeness over the next five to 10 years. If the age of the PHR takes off, it will bring about a wholesale change in the way that health information technology is structured and will radically disrupt traditional health care industry models. There are various other analogies to be drawn between the two historical perspectives. For example, do the trains and the rail system represent the traditional health care providers and payors in the industry who are maintaining data in silos and segregated systems? Can we draw comparisons between the powerful railroad industry versus the nascent auto industry and the current health care and insurance industry and the emerging Health 2.0 technology movement? Are the disagreements that occurred in the railroad industry over the gauge of railroad tracks analogous to the debate occurring over the need and process to develop standards for health information technology? Can we draw parallels between our country’s development of a national network of railroads through local, state, and federal initiatives to those ongoing efforts by state health information exchanges (HIEs), regional health information organizations (RHIOs) and the national health informational network (NHIN)? Will there be similarities between the freedom that consumers felt the first time they bought an automobile and drove it down the road and the feeling of empowerment experienced when a health care consumer adopts and uses a PHR? In the coming years, will the connecting of EHR and EMR systems and the development of the NHIN be relegated to being used to transfer bulk health data, not unlike the role that the railroad system plays today? As we look toward the future of PHRs, we have to understand that we are now looking at the Model T stage of PHRs: Call it PHR 1.0. The PHRs of the past 10 years and, in large part, the PHRs of today, are still relatively rudimentary and impractical, not unlike the first automobiles. I suspect my grandfather’s experience of traveling to Pittsburgh by train, having never owned a car before, to pick up his new Ford Model T and drive it back into the hills of West Virginia, was not unlike Dave deBronkart’s experience when he set up his Google Health account and imported his own health information from his providers. Prior to their experiences, neither knew how to drive the vehicle, but they learned in the parking lot. Once they both bought into the product, they didn’t have any good roads to drive on, and when the vehicle broke down they had to fix it themselves. However, through their efforts the world began to change, and their lives were and will be forever changed. Over the next five to 10 years, and probably longer, we may see PHRs become the multi-colored, sleek-designed, more powerful automobiles, analogous to the golden era of the automobile industry from 1940 to 1950. Continuously over that time period, new personal options will be developed as add-ons to the PHR. As PHR adoption grows, we will have to develop larger, longer and more robust highway systems to allow for the transfer of health data by and between PHRs. Likewise, new standards will come into existence, not unlike those adopted by industry or those created by government. Safety features also will be developed continuously to protect and secure the health information maintained, stored and transferred through PHRs. Think of these as the modern-day innovation, adoption and enforcement of traffic signals, the use of seat belts and requirement for guard rails. As we look toward the future, we also have to be aware that there will be game changers that we can’t envision at this time. Although PHRs might now be the industry solution to change the way we aggregate and store health information, new technology may be invented that disrupts this strategy and approach. For example, consider the impact that air travel had on the automobile industry. We must remain open to change in this new information era – change will be the norm and not the exception. The efforts by large technology companies and other Health 2.0 technology companies could transform the health care industry by triggering advancements in health information technology and laying the groundwork for overall health care delivery and payment reform. Although it is too early to say whether the PHR, in fact, will be the catalyst for health care reform, the Committee, government and the larger health care industry and community need to understand and explore PHRs and their role and consider how the consumer-focused PHR revolution will impact the health industry. This transformation in the way information is maintained, stored, and exchanged empowers the health care consumer by offering a new level of control and responsibility over his or her care. It will directly impact the patient-provider relationship. The traditional model for maintaining medical records, in which the provider of care stores, maintains, and updates the record, is based upon the need to provide continuity of care. The medical record reflects the plan of care, documents the care provided, and records communications among providers. Also, the medical record assists in protecting the legal rights and interests of both consumers and providers. In the 21st century, our health care system simultaneously has become more fragmented and specialized, on one hand, and more coordinated and wellness-focused, on the other. Health care consumers have become mobile and now seek the services from a variety of providers engaging in numerous specialties. These same consumers change providers on a regular basis and take advantage of new models of care, like urgent care services, to complement traditional primary care services. The increasingly mobile population has caused breakdowns in continuity of care. As individuals move from city to city and state to state, they leave behind a trail of partial medical records – some on paper, some electronic – with various providers, insurers, and others. The increasing popularity of EMRs, EHRs, RHIOs, and HIEs signals a need to address the increasing complexity of maintaining and sharing these different types and silos of health information. The PHR may be the disruptive technology that provides a simple alternative to ongoing efforts to create an interconnected network of interoperable health information systems with detailed querying functions, capable of making accessible in one place the health information and continuity of care record for individual consumers. In contrast, PHRs would travel with health care consumers and provide a central location for information regarding the consumers’ individualized needs. The shift to a consumer-controlled PHR from a provider-based and controlled medical record raises traditional property law issues. As health information becomes increasingly networked and technology permits health information to be transferred more easily, the lines demarcating ownership of health information become further blurred. Health information is often viewed under the traditional notion of property as a “bundle of rights,” including the right to use, dispose, and exclude others from using. This legal application of historic property law may not be well-suited to the information age, in which patient information is shared through a variety of formats, copied, duplicated, merged, and combined with other patient records into large scale databases of highly valuable information. Who owns health information? The physician? The insurer? The health care consumer? Under the traditional theory, providers own the medical records they maintain, subject to the consumer’s rights of access in the information contained in the record. This tradition stems from the era of paper records, where physical control meant control and ownership. Provider ownership of the record is not absolute, however; HIPAA and most state laws provide consumers with some right to access and receive a copy of the record. Health care consumers have received other rights out of the bundle of property rights, including the right to request corrections to their medical information and the assurance that such records are maintained confidentially. The PHR model, where all records are centrally located and maintained by the consumer, flips and realigns the current provider-based ownership model of managing health information. Instead of provider-based control, where the provider furnishes access to and/or copies of the record and is required to seek patient authorization to release medical information, the PHR model puts the health care consumer in control of his or her medical and health information. Vince Kuraitis, E-CareManagement Blog, Birth Announcement: the Personal Health Information Network, March 8, 2008, http://e-caremanagement.com/birth-announcement-the-personal-health-information-network-phin/. Alcantara, Oscar L. and Waller, Adelle, Ownership of Health Information in the Information Age, originally published in Journal of the AHIMA, March 30, 1998; http://www.goldbergkohn.com/news-publications-57.html.